This week's #wholemama theme was "be". It was a really open theme, and the more I thought and read the other posts written, the more clarity I kind of picked up about it. The idea is how to be a mother and also to just 'be' - yourself, who you are, who you were before kids and who you are afterward. I have been for as long as I can remember. It's been my primary hobby for essentially my entire life. I could read before I could ride a bike without training wheels. I argued my way into being allowed to check chapter books out of our school library a year before the rest of my class. My grandmother was our town librarian, and I knew how to check out my own books before I was tall enough to see over the counter to get the stamp without a step-stool. I've always been the one to be curled up in the corner with a book. I don't like large gatherings of people, and I'm uncomfortable at best with small ones. A book is my security blanket; if I always bring a book, I always have a way out. If I don't have a book I will hunt through the house to find a magazine to read. The written word is my primary language. I write with more authority than I speak; I always have. My fingers keep up with my brain better than my mouth does, and with writing you can write and re-write and re-work until you know everything lines up, the grammar is correct. You can fix it before it's ever seen. 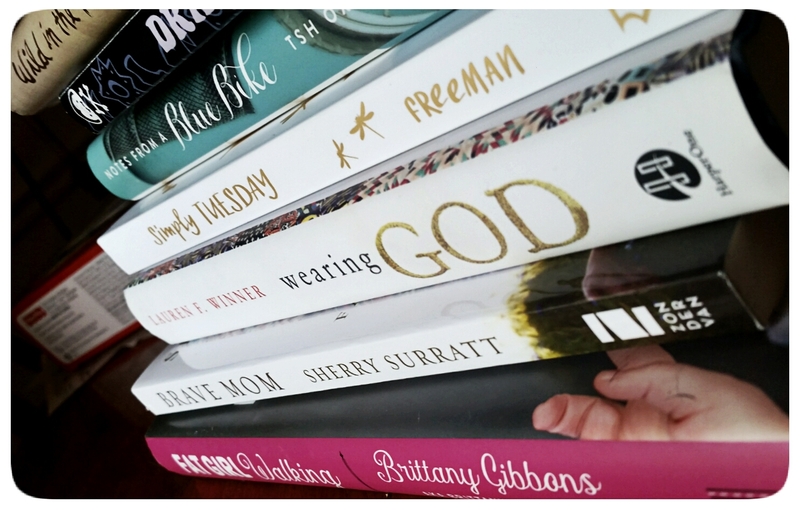 When I was in my last weeks of pregnancy, I was put on bedrest and I bought a metric ton of books. These things were not unrelated. The books were part of my hospital bag, and also my lifeline to sanity in the days and weeks after Audra's birth. While you might not think a newborn would give you much time to read, they do tend to sleep in two-hour shifts - and since it took me about three weeks to feel like I could put her down to sleep (and longer than that to feel like I didn't have to stare at her nonstop to make sure she was breathing), I spent a lot of time with a baby softly exhaling on my collarbone and either Netflix or a book keeping me awake. So... I've had to let books drop by the wayside. Unfortunately, that's meant dropping a significant stress-reliever and way of reorienting myself. I feel a little off-balance without them, like waking up suddenly with a peg leg and no idea how it got there. I sneak words where I can - in the car until I get so carsick I cannot read any longer, at work during my lunch break. For a long time I couldn't even use Audra's naps - I needed that time desperately to clean and cook dinner and do housework and to do literally everything that needed done in a whole day's worth of time. I'm kind of done with that whole way doing things, though. I've decided to take reading back. I am making a concerted, serious effort to muddle my way through those books I still had left to read, and to let myself be distracted by others in the meantime. I read in the afternoons while cooking dinner with Audra sleeping, I read until her little voice on the monitor shows me she's awake. I read before bed after she goes to sleep. I read past the time I should let myself go to bed. I have started taking books to gatherings again. I feel a little less uneven. I still have so many books to get through, and more coming out I want so badly to read, but I let myself breathe and take my time. This is how I give myself peace; I put on Bob's Burgers on Netflix and I open a book and I make a cup of tea, and I just... read. With words, I can just exist. It's hard to let myself relax, to be honest. There are always fourteen million things I didn't have time to do today. There's always a floor that needs swept or toys scattered around or just one more thing I could do if I had time. I've decided, instead, to devote all the minutes outside of what must get done to what I want to do. What I want to do is live in books for a while, and Audra is in that perfect stage where she needs to go to bed pretty early but doesn't have enough language to start trying to negotiate her way out of it yet. After she falls asleep, I pick up a book, and I just exist there. I feel better in the morning when I had time to read the night before. I feel like I can get back to just being who I am again. Part of motherhood, I think, is seeking out moments when you can just exist, the way you could just be before you had to think of if the diaper bag is ready for daycare tomorrow and if there are two bottles ready to go and has the floor been swept and just what is she trying to eat right now?! You probably don't want to know the answer to that question. Wild in the Hollow by Amber C. Haines. I won this book in a #wholemama giveaway! It came signed and with a beautiful printout of a quote from the book. I read it in less than ten hours total over the course of two days. I could barely put it down long enough to go to sleep or work. Amber writes with a kind of rollicking poetic voice. It's a very southern book - her environment is as important as the people around her. Kind of a hymnal drenched in honeysuckle. Loved it. Gummi Bears Should Not Be Organic by Stephanie Wilder-Taylor. I've been trying to finish this forever! I keep losing it in the house. I should probably be better at putting things back where they go. This is a "mommy humor" book, and I collect them like trading cards at this point. Hilarious! I'm so glad I found it again so I could finish it. Wearing God by Lauren Winner. I've been taking my time with this one, reading it kind of around other books, when I have the time to really read and re-read paragraphs. Exceptionally well-written, and probably my favorite of her books. Far From the Tree by Andrew Solomon. A seriously incredible look at families with children who are born 'different' - dwarfism, deafness, schizophrenia, autism, and other differences are looked at in great detail, with Solomon really getting into families and how everyone deals differently. It sounds depressing on the surface but it's actually an incredible look at how parents can love their children no matter what in a thousand different ways. Accidental Saints by Nadia Bolz-Weber. I reviewed her first book, Pastrix, here when it first came out. I have Accidental Saints on pre-order. Nadia is a great writer and speaker (one imagines you sort of have to be, to be an effective pastor) and I'm really looking forward to this one. If it's anything like Pastrix, I'll reread it two or three times within a couple of months. The World Is On Fire by Joni Tevis. I just picked this up at M. Judson, our new bookstore downtown (along with this awesome Dracula counting book for Audra!). It's billed as a sort of poetic, wandering look at America's strange obsession with the apocalypse and the End of Days. I've never read anything by her before, so I'm not sure. But I couldn't bear to not buy it after reading about its subject. People of the Songtrail by Kathleen O'Neal Gear and Michael Gear. I wrote a long time ago about how this series of books is essentially my guilty pleasure. They are the books I always fall back on when I want a fast-paced read and to just really enjoy a book. The Gears are working archeologists, and their books (which focus primarily on pre-contact North American nations, but have recently delved into post-Contact stories) combine the best of fast-paced fictional thrillers and well-researched, accurate historic detail. Their newest is about first contact between Canadian natives and the Vikings who were the true first Europeans to set foot on North American soil. Even just writing out that list made me feel more peaceful. Some people organize their houses. I make lists of books, and just pretend I can't see the disorganized mess behind me. 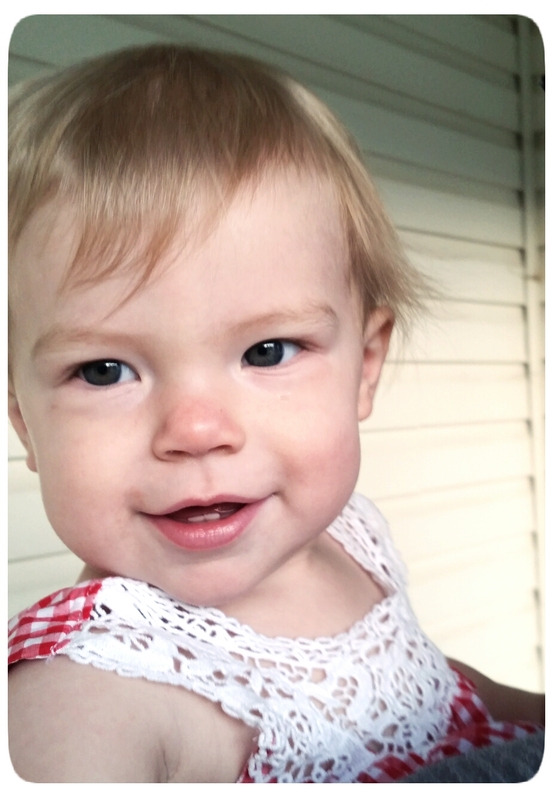 Today's post is my seventh while participating in the #WholeMama linkup. 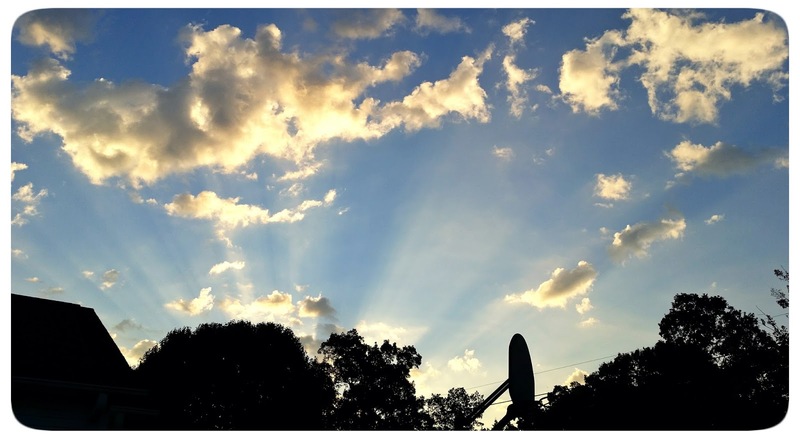 You can find the linkup for this week's theme, "Be", on Erika Shirk's blog Overflow. More information on what #WholeMama is all about can be found here. My other posts as part of the linkup or just inspired by the theme are I Lay You Down to Sleep, My Love, When It Rains... Celebrate, Parenting is Silly, Anything But Ordinary, Space, Prayer, and A Supermom is a Sleep-Deprived Mom. When Audra finally decided she felt like moving somewhere instead of just waiting around for us to carry her there, she chose to scoot instead of crawl. In fact, what she does to get from point A to point B can be more easily likened to a kind of backwards crab-walk than it can to true scooting, but hey... whatever gets you where you're going (that doesn't involve me carrying 25 lbs of baby around all day) is good enough for me. Jason and I tried to keep her in her room or in the living room, where her myriad of colorful, wonderful, sing-songing and light-up toys lived. She has toys coming out her ears. Toys from Illinois family and friends, toys from South Carolina family and friends. A giraffe she can ride on, a Fisher Price classics TV that sings to her, a wooden Animal Rescue shapes sorter that she loves... just all the toys. So she, of course, was far more interested in making it to the kitchen, where no toys lived... but where the dog's water bowl is. I would no sooner take ten steps away to start working on dinner than I'd find myself trying to catch Audra's hand as she splashed happily in what she wholeheartedly believes is a whole silver dish of Splashy Splash just for her. Like her bath, but cold and with more of me making those hand-flappy motions she thinks are so funny. We don't have a baby gate; we just haven't really prioritized picking one up, since our house isn't all that big and there aren't that many places she could go. There's the living room, the kitchen, and her bedroom - all the other doors are closed. If she figures out how to turn doorknobs at 13 months old, I won't even be mad; I'll just be impressed. Still, it seemed like a good idea to try to corral her in one place, so we lined up chairs on one side of the living room, where a large cutout separates it from the kitchen. At first she would scoot right up alongside the chairs and kind of watch us and babble happily to herself. She never noticed that there was another cutout on the other side of the living room, where she could easily have just gone in a circle to get to us the other way. 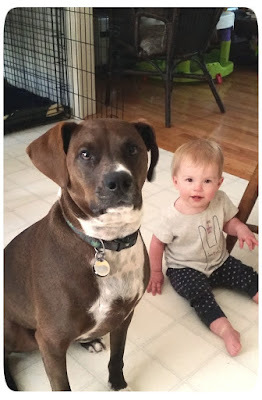 The dog knew this, however - so often he'd be in the living room with her, and she'd look up in confusion to find him suddenly on the Other Side of the Chair Wall drinking out of his bowl. It never occurred to him that the chairs were anything but some strange new force field that he had to obey. He could escape by going the long way, but never by going through. Audra remained trapped by how easily distracted she was and her inability to notice what was on the other side of the living room. She simply could not figure out how the dog was getting over there. A couple of months ago, though, the tables turned. One day I was working on dinner, sort of humming to myself. I'd put the Chair Wall in the way so Audra would stay in the living room and I could hear her talking to herself happily while she tore a magazine into shreds and then sat on them. Indy was in there with her. I stepped over to check on her briefly, and she held her arms up to me to be picked up. I shook my head. "No, honey, Mommy's cooking." Indy, who can't figure out 'roll over' or 'please God stop jumping on everyone' or 'you are licking me to death', nonetheless knows every single word in the English language that might possibly be a reference to food. He might know Spanish, too. He's a complex dog. His ears perked right up at 'cooking'. He looked at the Wall of Chairs, decided this strange new range of mountains was insurmountable, and went around the long way to trot into the kitchen and starting making his 'begging' face. Audra let out an insulted wail and kept her arms up. "No, honey, I'm sorry, I'll be there in just a minute," I said, and stepped back away to stir the onions. Audra let out a frustrated growl. The dog sat right by my feet. He doesn't know what onions are, but if we ever need someone to eat onions for us, he is there to save the day. After a second, I heard a weird noise. "Indy, quit it," I said, and then realized Indy had not moved. He was still sitting right next to my feet. In fact, one of his paws was on my foot. His eyes, however, weren't looking at me or the stove any longer. The strange scraping sound continued. I looked over at the Wall of Chairs. Slowly, inexorably, as though pushed by the slow movement of a flood, the Wall of Chairs was beginning to break apart. Befuddled, I stood there while my onions caramelized and watched my nine month old daughter very, very slowly push a chair out of line so she could get through. This obstacle was no longer simply a piece of the environment, immovable and eternal. She no longer had to stay behind it or go around. Audra now saw it as a challenge. The look on her face was similar to the way you might look at a mountain when you're trying to dynamite through it to make a road. For the very first time, she realized things didn't have to stay the same. She could change them herself. I continued to just stand there and stare as she crab-walked sideways to get through the small opening she had made, scooted triumphantly across the tile towards me, and showed me all five teeth in a huge smile as she held her arms up to me again. Helpless to do anything but reward her for her accomplishment, I swept her up into my arms, told her how smart she was, and gave her a big hug. So that's when I knew Audra was smarter than the dog. It's also the first time Jason came home to find me researching books on parenting stubborn children "because we should probably get ready now". My daughter has received three Incident Reports from daycare. The first two involved her being bitten on the little finger and having another child hit her in the head with a toy ball. 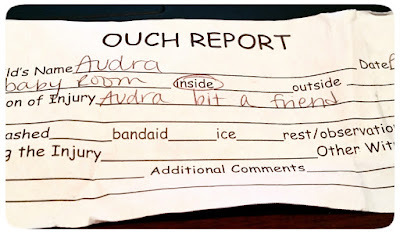 Both of those incidents involved no real injury, but apparently Audra cried a bit and needed some cuddles with the first one and basically didn't even acknowledge the second. Last week, we received the first incident report I'm honestly kind of proud about. Jason and I went together to pick her up, since one of the upsides to Jason's current Funemployment Extravaganza is that we get nearly four more hours together each day than we did before. Jason found the Incident Report in her bag. 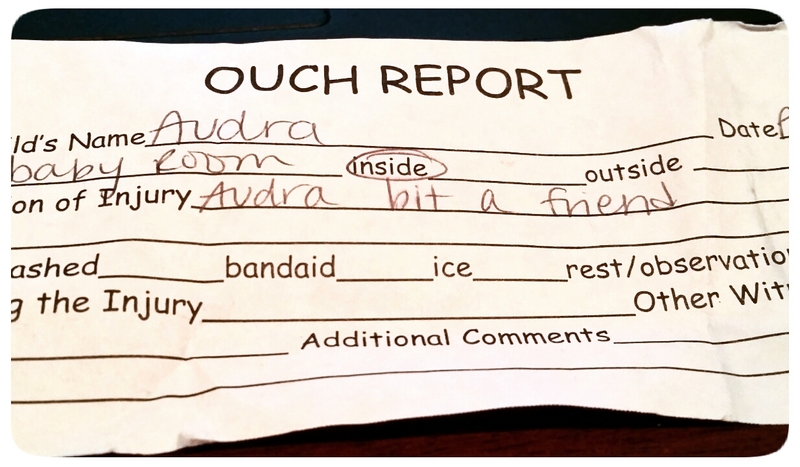 "Audra bit someone," he read, handing it over to me to check out. "Oh, no," I started to say, and then looked at Audra. ... who was smiling brightly at me with all seven teeth. You can argue that she's too young to understand and probably didn't even remember it happening... but that smile told me otherwise. This is when the daycare ladies rushed to her defense. "Well, it wasn't her fault," one of them reassured us. "That's true!" An older daycare lady nodded. "She never bothers any of the other babies. She was just playing by herself, minding her own business, and one of the other babies tried to take her toy away. So she just got mad, that's all." "So it's not like she just... bit someone at random," I replied. "For... fun or anything." I looked back at my daughter. She held her arms out to me and kicked her little feet. "Oh, no, not Audra. She never bothers anyone. No. The other baby messed with her first." She didn't start that fight, but she sure finished it. I lay you down to sleep. I make a cup of tea. Hug Riff Raff Giraffe so tight. No baby ever had eyes like yours. Then I lay you down to sleep. Your face clean of blueberry stain. Before that, of course, we brushed your teeth. I brushed them twice. Then you chewed on the toothbrush. So - first I brush your teeth. four five six seven teeth. One day you'll count them out to me. Skim through soft blonde hair again. So. I lay you down to sleep. I make that cup of tea. You're already on my mind tomorrow. You're holding court inside your crib. Are the silent audience in the living room. There's conversations to be had. 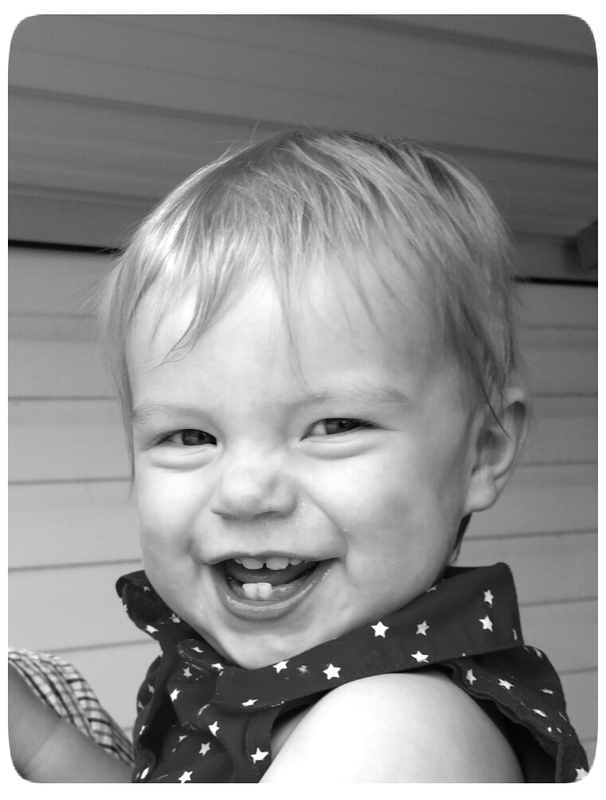 Today's post is my sixth while participating in the #WholeMama linkup. 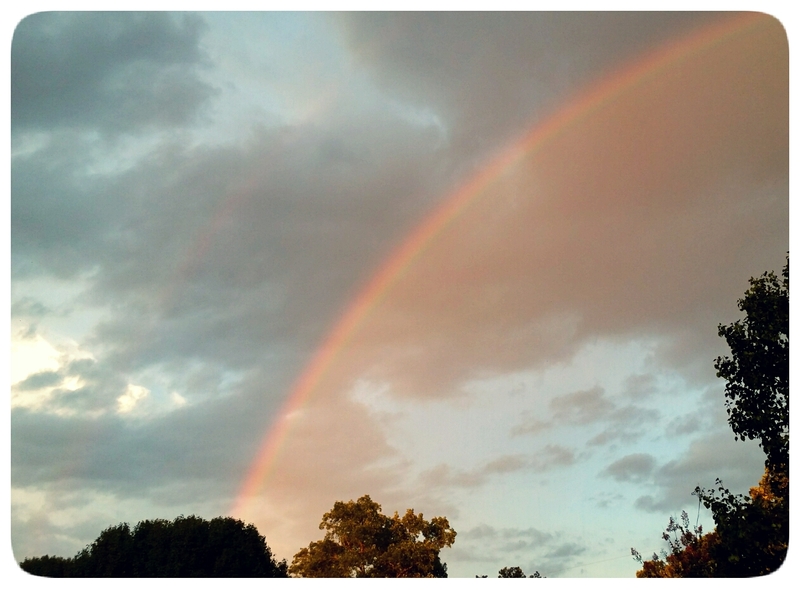 You can find the linkup for this week's theme, "Beauty", here on Esther Emery's blog. More information on what #WholeMama is all about can be found here. After this, the #WholeMama linkups will be happening at Erika Shirk's blog, Overflow. 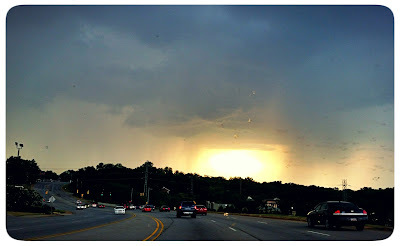 My other posts as part of the linkup or just inspired by the theme are When It Rains... Celebrate, Parenting is Silly, Anything But Ordinary, Space, Prayer, and A Supermom is a Sleep-Deprived Mom. - State Farm finally agreed with us on an amount. I received the check, made out to the amount we had specifically agreed upon, and I am now the proud owner of a car that is, in the manufacturer's words, "kiwi green". I am unreasonably happy about this. - We went to a specific dealership looking for a specific car. They had sold it already, and while I was happy to be shown other options, they brought out the sharklike salesman with a creepy personality to try to strong-arm us. We left and did not return to that dealership. - Instead, I bought my new (well, new to us) car the next day at a different dealership, with a salesman who did not talk down to me or try to strong-arm me. - My health insurance called. They fixed the problem, backdated everything, and my daughter and I have health insurance again. Or rather, we didn't stop having health insurance. Officially. - Still nothing from unemployment for Jason. Some possible job prospects, though! So we've got that going for us. - The tree that fell on my car is still lying in dead, crackly brown pieces on either side of my driveway. As I am now driving a larger car, backing out has become something of an exciting event for me. - Our jalapeno plant just exploded, and our Serrano plant is already in the process, and we simply cannot physically eat that many spicy green peppers. - We kind of forgot about the cucumber plant. It's still making cucumbers. I noticed several on the ground yesterday. Whoops. - The tomatoes have basically been destroyed by the boom-and-bust cycle of rain this summer. That month where no rain fell at all, where they were totally dependent on water out of the hose, was hard on them. Birds pecked at some. We went on vacation, and the four or five days where we weren't there to track whether they needed watering really made them feel betrayed. When it does rain, it comes down as hard as it can - raindrops don't fall so much as they curl into angry fists and punch the dry dirt - and then our poor tomatoes grow too fast, they split and burst. Our dog discovered tomatoes are delicious. Once we gated him out, we discovered a chipmunk also thinks our tomatoes are delicious, and he can get under the fence. Basically, it's just been a hard year to be a tomato at our house. - Audra appears to have re-learned how to sleep through the night. She has essentially slept through, for varying amounts, since Friday night. There is much rejoicing. Or at least the caffeine levels in my blood have very slightly receded. - I have actually been able to pick up my library book... two days before it was due back. Thank God for the 'renew' function. This may or may not be related to the previous point. - I might have cut up leftover hamburger patties and tossed them into tomato soup to create "cheeseburger soup". I maintain that this does not ruin my "foodie" status, because delicious is as delicious does, and this was delicious. So there. - Audra is moving slowly over to milk - right now we're at about 60/40 formula-to-milk ratio. The switch from bottle to sippycup is significantly more difficult. She's just sort of puzzled as to why we'd try to do that when bottles work perfectly and require less effort. Why fix it when it ain't broke? 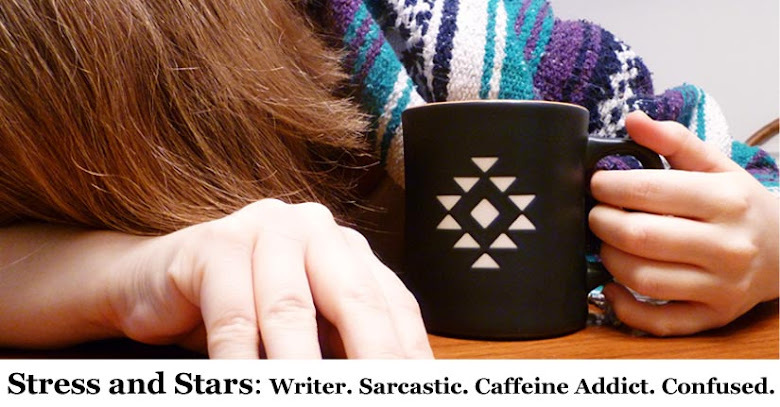 She seems to ask me, as she takes a single sip from the cup and then drops it and gives me a look of puzzled hurt. My explanations about making sure her teeth come in straight don't seem to be resonating. - That may perhaps be because she has no idea what I'm saying. - Yesterday, I went to Starbucks, got a flat white and sat for a half hour or so just reading this article in the New York Times. Then I went and picked up groceries. It all felt terribly adult and productive. I even fooled myself there for a second. - I can't stop scrolling through fall fashion. This is when all the colors that look best on me appear. Eddie Bauer is particular has three T-shirts that I am dying to own - a purple, a blue, and an orange in this pretty V-neck style. I'd have to get them in the tall-length because my torso is so long and no clothing maker understands that. I also have no money for these T-shirts. I am in the process of reminding myself that I don't actually require they exist in my closet to survive. - On a related note, Life is Good also has really pretty things for fall. I also don't need their stuff to live. - I mean, I might. - I am in the midst of a serious craving for peanut butter cookies. Like right this second. - I just ate a peanut butter cookie. I'm having a hard time with this week's #WholeMama theme. It's "celebrate", and with the week I've had, I'm running into some difficulties coming up with all that much to celebrate. 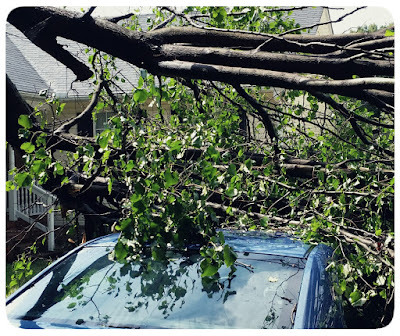 Last week, a tree fell on my car. It was a pretty memorable event. Everything started off completely normal - we had it towed, our insurance agent got on the phone with the adjuster, the rental was set up almost instantly, everything seemed to be going swimmingly. We didn't receive a call from the adjuster when we'd been told we would, but they're busy people, so no big deal. I want to reiterate here that our actual State Farm agent has been amazing - he's advocated for us, called the adjuster on our behalf. Kim, who works in our agent's office, has gone out of her way and bent over backwards to help us in any way she can. Until this, I had had nothing but positive experiences dealing with State Farm for automotive, renter's, and homeowner's insurance. I grew up essentially in the shadow of their corporate headquarters. My brother worked there. My parents have used them for years. I never expected to be treated like this. On Monday, the State Farm insurance adjuster calls me and, speaking at lightning-speed in the deepest, hardest-to-hear mumble you can imagine, starts listing off numbers and times and dates and things. He rarely paused or seemed to even need to take a breath. I wrote it all down, asked him to clarify or repeat himself, and said "okay" a lot. He apparently took this to mean I consented to everything he said - including offering us a "payment" of the piddliest, tiniest little amount after paying off what he stated was the value of our car. None of it sounded right, so I made sure he said I could call back with any follow-up questions, and took the numbers to Jason. Jason pointed out that the number he had given us in no way matched the actual value of our actual car. We have spent every single day since fighting to get the adjuster to acknowledge how much our car is actually worth. Half the time, we're fighting just to get him to answer his phone. Every time we overcome an obstacle he's given us, he makes up new ones to put off getting us the money we deserve. He's taken to heavy sighs and even once essentially threatened us financially by telling Jason on the phone that if we kept up refusing to just take the tiny payout, "the mechanic is going to start charging you 40 dollars a day in storage fees." Jason replied, "Then I guess you'd better solve this problem pretty quickly." I decided to call the mechanic himself, by the way - and was informed that they had no idea what the adjuster was talking about. There was no intention of charging us storage fees, especially once I told him what was going on with the adjuster trying to underpay us, and he hoped that this all worked out for me and wished us the best, just keep him updated. Because mechanics are not the monsters adjusters want you to think they are. The adjuster told us we needed to provide him with a list of at least five comps proving our value numbers, and it "couldn't be done by email". So Jason went to our agent's office and uploaded fifteen links to comparative cars directly into the system for him. At that point, the adjuster decided that wouldn't work, they had to be printed out into a certain format and then faxed. So Jason went to the library, printed out the comp links, drove back to the agent's office and then faxed them in. At 12:30. The adjuster, on the phone with him at the time, sighed heavily and said if they made it over by one, he might be able to maybe take a look at them, then hung up the phone. Obviously, he did not call us back before he left his office at 3:30. We've called twice today and are still waiting for any response whatsoever. Basically, we have spent a week dealing with an adjuster who is clearly trying to make this so difficult for us to do around work schedules that we would just give up and accept nearly two thousand dollars less than we deserve for the value of this car. What he does not seem to understand is that Jason doesn't have a job right now, is tenacious and stubborn and doesn't have much else in the way of plans this week, thanks buddy now write us a check for what you actually should, please. We got the time to go head-to-head with you. We got all the time. Then, my health insurance decided to join the pile-on. 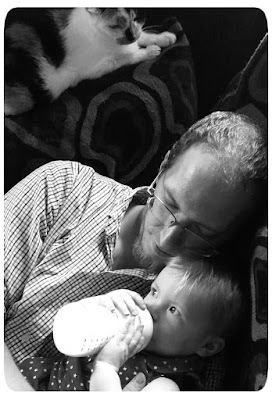 When Jason lost his job, we qualified for the tax credit for the first time. We hoped to only need it for a couple of months (we are still hoping for that), so I went and applied for it online. Somehow, the act of doing this completely upset my health insurance company, between them and the exchange they sent me the wrong effective-as-of date, suddenly declared us no longer insured, and sent me a letter telling me as much. Upon receiving a thoroughly nonsensical letter telling me my policy was canceled, I gave them a call. I have now spoken to either health insurance or the exchange people five times in four days trying to figure it out. They admitted the problem was their fault, but kept saying they couldn't fix it. No fix, no way to fix it, none whatsoever. Finally, yesterday they claimed they had a solution... my insurance would be fixed! Hurray! But wait, it would only kick back in starting September 1st. Leaving myself and my child essentially uninsured for nearly half a month. Now, I'm not that worried about me; I went without health insurance for years. But for Audra? That's not acceptable. I've been assured that they should be able to make it retroactive, maybe, possibly, if they decide that's okay... but I won't know for sure on that for at least thirty days. So I and my daughter just get to be without insurance for about half a month while our insurance company and the exchange try to decide whether or not they feel like actually fixing their mistake. But I can rest assured that if they decide to retroactively fix it, any bills we accrue for doctor visits or emergencies will be covered. Retroactively. If they decide they feel like it. So, basically, we have been told by our car insurance company that despite being loyal paying customers to them since I was a very young child at the least (my parents use them for car insurance, too) and despite paying to them for years on our own for auto, renter's, and homeowner's insurance... despite the fact that we have almost never used them, I have never previously been in an accident, Jason's only been in fender-benders while we've been with them, we've never asked for much of anything beyond paying for a tow... despite the fact that we are, essentially, their ideal customers... they have no intention of treating us with the fairness, respect, and quick action that we deserve. Then my health insurance company decided that I wasn't stressed out enough this week, and told me I just randomly don't have health insurance any longer, and neither does my daughter. Only, whoops! It's their fault! And they totally admit to that! Only they can't fix it. Except that they can! But not until September 1st! Except that maybe they can fix it for August, but I won't know until nearly October whether or not they would cover literally anything that happens to us in the interim! Wheeeeeeeee! This is on top of Jason losing his job in early July the day after we returned from a harried, frantic, stressful trip to see my family that was only harried, frantic, and stressful due to us having to cut it so short so that Jason wouldn't inconvenience his workplace. Then, the Best Road Trip Ever. 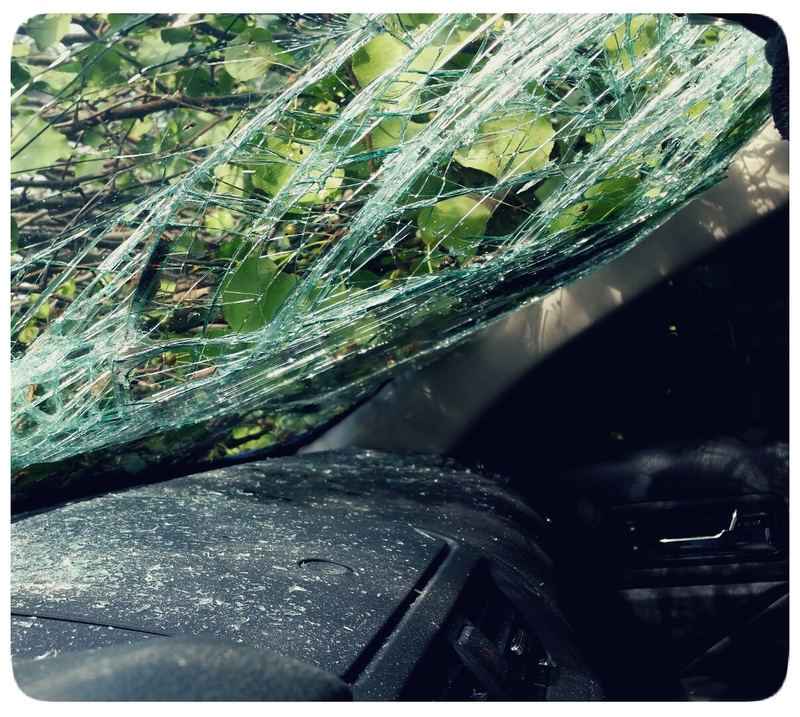 Then a tree fell on my car. Now Jason and I are in the midst of a war with car insurance and I've been royally screwed over by our health insurance. On top of all that, Jason's still waiting to hear from unemployment, who is taking their sweet time deciding on much of anything at all and not calling us back when we try to get in touch with them. We've had a great two months, guys. You can see where I'm having some trouble finding some things to celebrate. Because my job allows for good flexibility and work-life balance and Jason is no longer working a service-industry job that believes "personal life" is a silly joke we tell each other after his fifty-hour workweek finally ends, we were able to take a long weekend to stay with his family at their beachside condo on the coast. Three full days of waking up next to the ocean. Three full days of playing in the surf, of salt in my hair and getting sand all over everything. An anniversary dinner right on the MarshWalk, watching the sun go down and clouds roll in and the best sushi we've had in years at Wahoo's. Three full nights of falling asleep with Audra's breathing coming from her Pack n Play in the corner. Audra's been going through what I believe is the early stages of The Arrival of the Molars, which makes for sleepless nights and fussy days. Jason's been able to stay home with her, allowing me to miss less work than I would have otherwise. Our neighbor came over and helped us move the pieces of tree from the driveway to to the side of the road, cutting the time it would have taken us by more than a third and ensuring that we got back inside just as it got dark. He did this simply because he could, and he wanted to help. Audra's beginning to work at mimicking the exact motions we make when we speak. Her repertoire has expanded to include blowing kisses at will, giving me and Jason (horrible, wet, drooly) kisses, hugs, and trying to repeat when we say "uh oh!" to her. She has just begun pulling herself all the way to her feet occasionally. She tells us long and convoluted stories about whatever she is doing - we just don't know how to understand her, yet. I watch her learn every single day. My family drove into town for Audra's birthday party, and arrived Friday night. There had been some uncertainty about them being able to come, since my mom's last round of chemo was finishing up just before the planned trip. She felt well enough to come, so my sister did most of the driving and brought my niece, too! Saturday morning, Jason and I went to greet them at the hotel... only to discover that my dad was also here! I had thought he had to stay behind, and so it was definitely a great way to start off my day. I had my sister, my parents, and my niece for two full days, and was able to hang out with them and enjoy the time spent together. Now I have to grit my teeth and wait for Thanksgiving. Audra was sick and fussy, but rallied spectacularly for her party, despite the thirty-some people milling around waiting to see her when she finally woke up. Her great-aunt, great-uncle, and their twin girls were able to come into town and attend. The twins love Audra, and it's great to see them interact. So many people like me, Jason, and our baby that much to attend a birthday party where the birthday girl cries at her smash cake and can't even tell them thank you out loud yet or visibly enjoy her gifts all that much. When Jason lost his job, I was able to sit down with him and say, "Okay, I think we can live on my salary until unemployment starts coming or you get a new job." A year ago, we would have been staring true disaster in the face. My in-laws and Audra are incredibly close - she will hold her arms up for them to take her the same way she does to us. They give us the occasional night to ourselves to regroup and recharge and just be adults for ten minutes. I have friends who are willing to take my dog at fairly short notice and wonderful enough to keep him for a little extra time if we end up running late getting home from a trip. My dog loves my child, and goes right to her to try and lick her face when she's on the floor. My family is wonderful. Jason's family is wonderful. My friends are wonderful. My mother's health is good, after last year's pretty exciting cancer adventure. Jason and I are (generally) healthy. We managed to keep a baby alive for a whole year without losing our minds. We get away with wearing pajama pants for hours at a time way more often than you think. This is what I have to celebrate. Family, friends, life, love. That is where my celebration is. Even if it seems like life can't seem to stop piling things on us, we have the support and the love we need to just keep swimming. When it rains, it pours, they say. 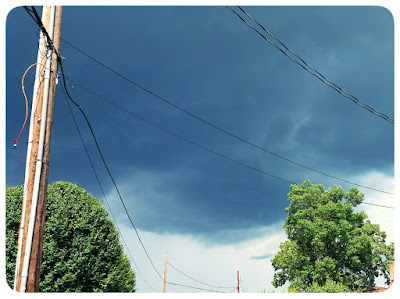 I feel like everything going wrong has been the clouds rolling in, nothing but thunder and the promise of a violent storm, nothing but the idea of a storm and unending dry air. Every time I get to where I just want to lay down and take a three-month nap, my family comes into town, my friend offers me coffee and bookstore time to get away from life, my family (both mine and Jason's) help me pull off the biggest party I have ever thrown in my entire life, or Jason and I sit down to play with Audra and spend a solid hour laughing so hard our sides hurt while she learns from us what it means to be human. When it rains in the middle of a hard, dry season, a farmer celebrates. 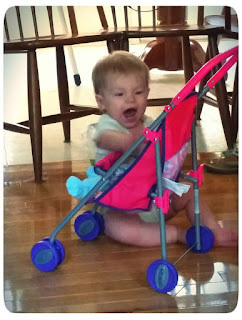 Today's post is my fifth while participating in the #WholeMama linkup. You can find the linkup for this week's theme, "Celebrate", here on Esther Emery's blog. More information on what #WholeMama is all about can be found here. My other posts as part of the linkup or just inspired by the theme are Parenting is Silly, Anything But Ordinary, Space, Prayer, and A Supermom is a Sleep-Deprived Mom. Okay, okay. It was just a tree limb. A tree limb the size of a small tree, of course, but still just a limb. Audra's fighting off a cold, so I kept her home from daycare yesterday. She's been running a fever basically nonstop, with very little in the way of symptoms otherwise. She's just tired and feverish and doesn't have much of an appetite. Her little body felt like lava when we picked her up in the morning, so we just decided to keep her home. I went ahead to work and just came home a little early so that Jason would have time to work on a project he badly needs to finish. Just as we made the switchoff and he got all his equipment set up, the sky went from mildly cloudy to very, very dark gunmetal-blue. While the sky grew darker and darker and thunder began to rumble, Jason looked at all the equipment he had just spent twenty minutes setting up... and brought it all inside again. When the storm hit, it really did hit. It was a thunderstorm curled up in a fist, a sudden one-two of drenching rain and gusting winds. I watched our Shrubs of Doom in the backyard sway back and forth uneasily from our bedroom window, while Audra piteously fought sleep in her room and our dog lurked as close to us as he physically could get, since approximately three months ago he randomly decided to start being scared of storms one day. "If any trees are going to get knocked down, it'd be right now," I said out loud, because I like to jinx myself and the universe finds doing this to me just super funny. About twenty minutes after the storm ended, with Indy out sniffing all the leaves that hadn't been in the yard before, we heard his barking change from his 'curious' sound to his 'warning' bark. Then the doorbell rang. It didn't wake Audra, who had finally quit fussing and fallen asleep. If it had, I might have answered the door with a blowtorch. It was our neighbor, who started up with, "I just pulled in from work and I don't know if you noticed yet..."
Underneath a huge Bradford pear tree limb. We thanked the neighbor for letting us know, and then we spent a good few minutes just staring at it and taking photos of the damage. "Your sunroof is basically gone," Jason said. I took a photo. I took like ten. Then we looped a rope around the tree branch on my car, tied the rope to the trailer hitch on Jason's old truck, and pulled the stupid thing off in order to get a better look. "My windshield is basically gone, too," I said. I took about twenty-seven photos of that, and the glass coating the inside front seats, my wet CD case, just everything. Then I sat and called our insurance agent. When Jason and I first moved to South Carolina, we were a one-vehicle family after the final roadside death of his tiny Ford Mustang. I basically insured the Mercury Cougar that was at that point our only car up to its neck, and have simply kept up that level of insurance even as we switched over to our newer car last year. So... basically what I'm trying to say is that I pay State Farm enough that they all but offered to send me a limo. Jason and I stood outside, the baby monitor slung on my jeans pocket so I could hear if Audra woke from her nap, and waited for the tow truck. No fewer than three cars slowed to a crawl as they drove past, and one guy even turned around and came back so he could let us know about his cousin who owns a tree service. The tow truck guy came and also offered to cut up the tree branch for us. Eventually, after around two straight hours of chainsawing, we had manageable limb pieces and Audra was back asleep. Jason, our neighbor, and I dragged pieces of the tree to the ditch to clear up the driveway. We finished literally right as it became too dark to go on. I slept on the couch so that Jason might actually get a decent night's sleep, since otherwise he always wakes up first when Audra fusses at night and he basically hadn't slept in a couple of days. Between the dog, the cat, and Audra herself I got about three hours of sleep between 11 pm and 3:30 AM, when I finally came in and just laid down in bed. About five minutes later, Audra started to fuss. Jason got up and took over, and I slept for two hours like a log until my alarm went off and I dragged myself to find Jason and Audra passed out together on the couch. I took back over and Jason got another hour and a half of sleep before we had to figure out the rental car and getting Audra to her Nana's house for the day so I could go to work. So that's my newest addition to 2015: Best Summer Ever. 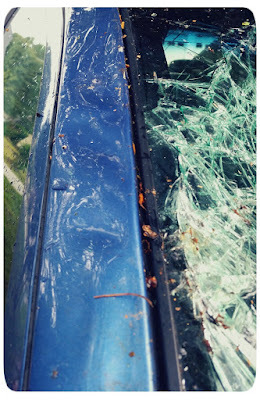 Jason losing his job for no reason whatsoever and the Best Road Trip Ever were tough acts to follow, but by God, a tree limb falling on my car definitely made an impression. Common sense flies out the window, as do all your lofty ideals about the absolutely perfect way you will raise your child. You won't make those mistakes the other parents make, after all; your child will be quiet, and docile. She'll be well-behaved in public. He'll soothe himself to sleep by four months old! My child won't be a picky eater. I'll ensure they eat nothing but vegetables and fruits, grown at a local organic farm and pureed in my own home! The thing about humans is that we are completely unreasonable. Audra mostly eats whatever we're eating for dinner, but sometimes she didn't wake up happy or doesn't feel well or is just feeling especially difficult today and I give her strawberry cereal puffs and some Gerber cheese puffs and comfort myself with the fact that it's something, and something is better than nothing. I have never pureed a single batch of baby food. I bought it and then she started eating real food and you know what, what matters is that the broccoli and the carrot got into her, not whether or not they came from a pouch at Publix. When I wake up in the middle of the night and can't sleep, I tiptoe around to try not to wake up Jason and shush the dog's happy wiggles when I come out into the living room, hoping he won't make enough noise for Audra to hear it in her nursery. I brew coffee by taking the coffee grinder into the furthest corner away, wrapping it in a towel, or even taking it outside so the noise won't be enough to bother anyone. I drink in silence. I stay in my place, making as little noise as possible, coaxing the dog to curl up at my feet so she won't hear him pattering around. 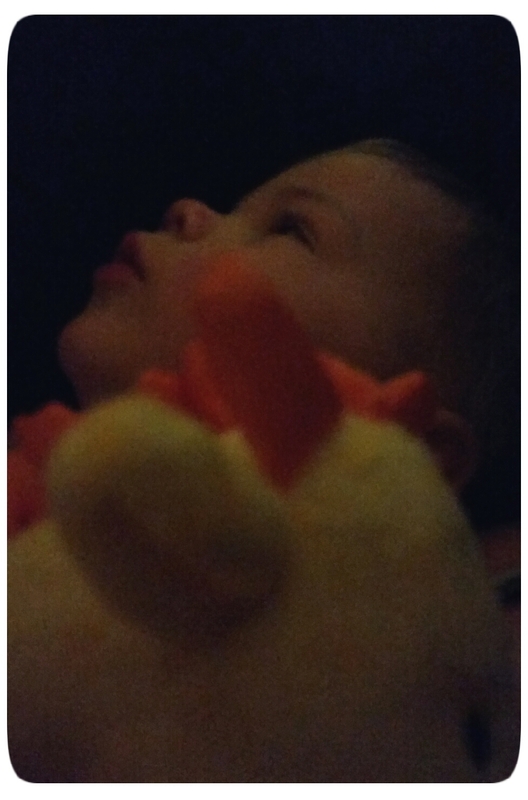 When Audra wakes up in the middle of the night and can't sleep, she peeps at first. She has figured out that the blue light that is always on in her room (IE, the top of the baby monitor) has something to do with causing us to hear her, so she tends to direct her noise in that direction. When that doesn't wake us up, she'll start shouting or making awful whiny noises until one of us stumbles in, bleary-eyed and barely conscious. There are days where I feel like I want to do nothing more than just sit still for an hour and there simply. isn't. time. I go from waking up to dropping her off at daycare to work to home to starting on dinner to her coming home from daycare to dinner itself to dinner for her to playtime to bathtime to bottle to bed. Then I blink and it's 9:30 and I might have half an hour to read or stare blankly into space until we need to sleep. Right now, with Jason not working and unemployment still up in the air, I like to add "worry incessantly about money" into that list, at least six or seven times a day. It's exciting! I find it's best to worry about money at 10:45 at night when there is absolutely nothing either of us can do about it. I'm a worrier, by nature. I run myself in circles by default, and have to be coaxed into relaxing. It's not that I don't laugh often; I do. But behind my laughter is a constant circle of things I should be worrying about or things I shouldn't worry about but can't help it. If I don't worry about money or time for ten minutes, she'll have my sides hurting with laughter. She's unreasonable, and even in her all-consuming fury we can't help sometimes but laugh, because sometimes there is nothing better than laying aside reason in order to just have fun. Her obsessive, co-dependent relationship with her toothbrush alone has been the cause of days of stress-relieving giggles. 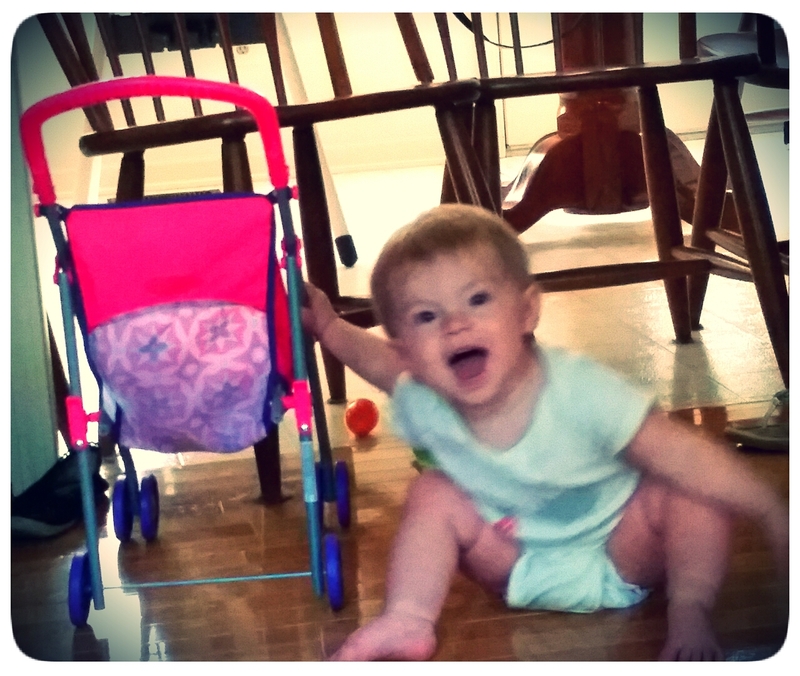 I put her baby doll in its stroller for her to push around, and she smacked Baby in the face, shrieked happily at it, and knocked the stroller over. Then she casually yanked Baby out, threw her aside, put the stroller back up, and replaced Baby with a blue bouncy ball which she proceeded to delicately push around the room, singing "da ba ta da" to it in a soft, soothing, utterly maternal little voice. Once, she was splashing so hard in the bathtub she hit herself in the eyes and I held her indignant little body and laughed until she forgot she was angry and we laughed together, neither one of us entirely sure what was so funny, just knowing that I and the bathroom floor were soaked too and that was perfectly fine. The sleep deprivation may have helped me find more humor in the situation. Sometimes, she'll just sit and make fake-laughing noises until she works herself into laughing for real. 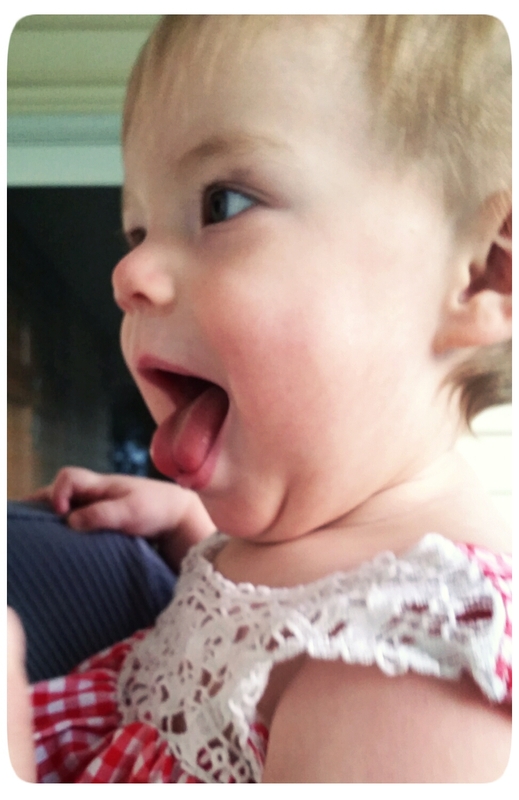 My baby girl cracks herself up. I know I've got a couple of years until the incessant toilet humor begins, or the jokes that don't make any sense but that leave the child in question rolling on the floor in tears at their own cleverness. I've got more years than that before they're flinging themselves sullenly behind a slammed door, and I'm on the other side trying not to undo their dramatic flair by laughing myself silly at the senselessness of it all. Parenting an irrational, unreasonable little human being is pretty silly, too. Sometimes, silly is the only thing that lets us slow down and see each other. Today's post is my fourth while participating in the #WholeMama linkup. You can find the linkup for this week's theme, "Silly", here on Esther Emery's blog. More information on what #WholeMama is all about can be found here. My other posts as part of the linkup or just inspired by the theme are Anything But Ordinary, Space, Prayer, and A Supermom is a Sleep-Deprived Mom. It began, as so many of my stories do, at a Starbucks. We just spent the weekend (Thursday - early Sunday) having a family beach trip with my in-laws. Time was spent at the ocean and watching movies, cooking and eating and talking and laughing. Audra had fun, Jason and I had our anniversary dinner right on the water at the Murrells Inlet Marshwalk and ate some of the best sushi and sashimi I've ever had at Wahoo's, ended up badly sunburned when we discovered that the sunscreen we'd used was expired and therefore it was like wearing no sunscreen at all during the two and a half hours we spent in the surf. Luckily, it wasn't the stuff we use on Audra so she came back from the beach basically as white as she was when she left, and Jason and I didn't come back darker so much as looking like tomatoes that are just about ripe. It was a good time had by all. So this morning, we packed up to go home. I wanted to stop by Starbucks first, as is my way when I will be both in a car and also on a road for any length of time. I went to get into line - the place was packed. A couple of minutes in, something stabbed me in the eye. I thought an eyelash at first, but I couldn't seem to get it out, so I went to the bathroom to deal with it. Several minutes later, I came back out to discover the line had gotten even longer in my absence. I sighed and got back in line. Just behind me were two teenage girls who spent the entire line wait talking loudly about how much they hated their families because they kept, like trying to be nice to them but they also expected them to, like, clean stuff. They kept trying to one-up each other on how utterly awesome and totally badass they were. "So I said to my grandma, I said B***h this ain't no cappucino! She buys me that f*****g Nescafe cappucino s**t like it's, like, the real, like, coffee thing!" "Yeah, well, you should've heard me, my mom asked me to clean up the couch the other day and I was like, Mom, you must be f*****g kidding me, I don't clean no f*****g messes in this house!" I just stood there, trying as hard as I physically could not to acknowledge them. Another woman in line ahead of me caught my eye and the both of us just smiled and shrugged at each other. All I could think was, One day your grandma will be gone. She bought you Nescafe Cappucino mix because she knows you like coffee and she was thinking of you one day while in the store. She remembered you said you like cappucinos at Starbucks, and thought you'd like this, too. If you really responded to her thoughtfulness that way, that may be the saddest thing I've ever heard. But really, they were just being kids; showing off for each other the way you do when you have something to prove but you're not sure just what, yet. Odds are neither of the interactions described actually happened, beyond perhaps the sullen mumbling that is the language of people between ages thirteen to eighteen and a half. In any case, after the twenty minutes it took me to deal with the thing in my eye and then get my iced coffee, I came back. We'd lost valuable happy-Audra-in-the-car time, so Jason and I took off pretty quickly, hoping to gain back what we'd lost. Then we got on the interstate going the wrong way. 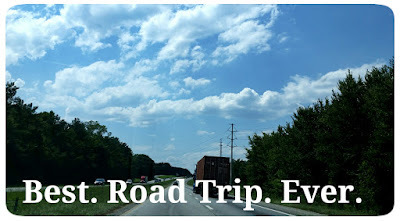 It ended up costing us another twenty minutes, as we discovered that particular part of I-95 actually contains absolutely nothing but trees, some swampy areas, and a few more trees. And maybe some kudzu. We had to drive for over ten miles to get from one exit to the next, which isn't that far unless you're driving the wrong direction, trapped in traffic moving slower than the speed limit because someone apparently shouted the word 'cop' six miles ago and nobody's taking any chances. We drove down to the next exit, turned around, and came back. At this point, we'd cost ourselves forty minutes of progress and were looking at a five-hour drive that was supposed to take four hours and twenty minutes. Audra had been eating very little but drinking her formula pretty steadily. She was cheerful, chatty, and in no way acting ill.
We stopped at Bojangles for lunch, where we tried to get her to eat some of our food but could only coax her to take a few nibbles here and there. We finally gave up, figured she just wasn't hungry, and gave her a little more milk as we got in the car. She sucked that down suspiciously quickly. We just shrugged. Maybe she was hungry? Then, four hours into a drive that should have been 4 hours and twenty minutes long, but was already going to be at least five hours, Audra began to spit up. Jason watched her in the rearview mirror with increasing alarm as she burbled up more and more and more and more. Her little hands up to her mouth, trying to catch it. I couldn't quite see her without turning completely around, but I could hear her. I know that sound. That sound for me is like elephants can sense volcanoes erupting two hundred miles away. Oh, no, I thought. "Oh no," Jason said out loud. Then we said some other things that we probably shouldn't repeat in public. Audra began to cry, just a little, as she started to really feel wet and cold and the car... oh, how the car smelled. We couldn't do anything - we were on I-20 at this point, just outside Columbia, surrounded by cars. We had to drive a little over a mile and a half to the next exit, while our baby continued to be Linda Blair in the Exorcist all over the carseat, the backseat, and herself, giving the occasional little heartbreaking cry of discomfort. We pulled into a tiny gas station. "You clean the car," I said, as we wrapped our soaked-through baby in a towel to protect ourselves from the horror contained within. "A gas station this small probably only has a changing table in the womens' room." Then I took my toweled-up baby inside, ignoring the slightly hostile, curious stares of the cashier and several other people (one man, who held the door for me as I went in, just said "I had a baby once, too," and grinned at me and let me tell you, that helped me so much to have someone not look at me like I was in a circus in the 1910's) and swept her into the womens' room. Which, turns out, didn't have a changing table. So I took a deep breath, sat her down on the countertop between the two bathroom sinks, and had Audra stand up, trying to touch as little of her as possible as I poured warm water over paper towels to clean her. About ten minutes later, I took a mostly-clean smelling-like-baby-wipes-and-spitup-and-sadness Audra back out to the car, what remained of her clothing wrapped in the towel. Jason was still working on cleaning out the carseat, which was essentially ruined. We did the best we could to sort of whip together a way to make the plastic shell of the carseat less horribly uncomfortable without its soft padding (which was, after all, soaked in the same pile of regret and Bojangles food as everything else that had been anywhere near her)... and we got back on the road. Between lunch and that happy little side jaunt, we'd lost nearly another hour. 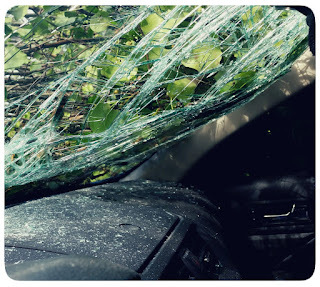 Then we discovered a man on I-26, on the last seventy miles of the whole trip, who appeared to be a drunk driver in broad daylight on a Sunday afternoon. Either that, or he was blind and driving entirely by sound. He was weaving back and forth, usually with at least two tires outside of the lines for his lane (where they hit the grooves in the road and become very loud) but very rarely all four within. Every time he'd hit the grooves, he'd swerve back but end up swerving into the OTHER lane. We were pretty convinced he was drunk, and fought to get in front of him. He tailed us for a while, weaving back and forth, the vehicular embodiment of the drunk guy trying to do the Sobriety Walk. Eventually we were able to get away from him, and finished the drive in relative peace. We made it home, six and a half hours after beginning a drive that should have lasted four hours and twenty minutes. The first thing we did was give the baby a bath. The second was to put the cloth pieces of the carseat in the wash. The third was to try to figure out how to clean the carseat itself. We're still working on that part. If you ever want to test your love for your child, cleaning them up after a spitup episode in a tiny gas station bathroom with no changing table is a great way to do it. Also, today was our seventh wedding anniversary. Somehow, we all still love each other.